Water condensing on the surface of the CCD sensor is bad news. A well cooled astrophotography sensor will easily cool the sensor down to around -20C, and lower is not uncommon. CCD Cameras have their sensors mounted in a dry chamber to keep water vapour away from the surface of the chip. Often the first sign of water-on-the-chip is when you see ice crystal shadows on the edge of your flat fields, or a thin layer of moisture over the sensor when it is turned on. This problem completely ruins your images. Most CCD cameras have some kind of medium to dry the camera. A desiccant is usually included in the dry chamber, and you have to regularly check your camera for signs of moisture and recharge the desiccant. Most desiccant these days is silica gel granules. The are a rich orange colour when dry and turn a paler colour when they are loaded with moisture. Silica Gel desiccant can normally be dried out in a domestic oven or microwave. There is a new weapon in the fight. 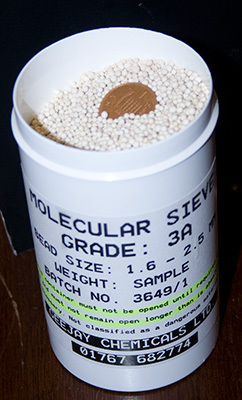 Molecular sieves. A molecular sieve is a material with very exactly sized pore which absorb different moistures and gases. It just so happens that grade 3A molecular sieve material is very good at absorbing water from air. It out performs silica gel by an order of magnitude. Unfortunately I've never found anybody on Ebay, or elsewhere selling the stuff. One day, during some idle web searching, I found a UK company, Geejay Chemicals who supplies silica gel and molecular sieve materials. I sent them an email explaining who I am, and the nice chap sent me a "sample" of molecular sieve material. I was expecting a little packet the size of a thimble and was pleasantly surprised to receive a half pint container of 2mm molecular sieve granules. I now use these in all my astronomy CCD cameras instead of silica gel, and it works much better in my experience. The only downside of molecular sieves is the recharging of the material. The dry it out, you have to heat it to 400C - which is more difficult than drying out silica gel. However, I have about enough to last me 20 years, so I'll worry about that problem when it comes around! If you have constant problems with moisture on the sensor of your ccd camera, see if you can try molecular sieves for superior camera drying!